Executive View from Silicon Valley: Advertising Joke or Marketing Blunder? 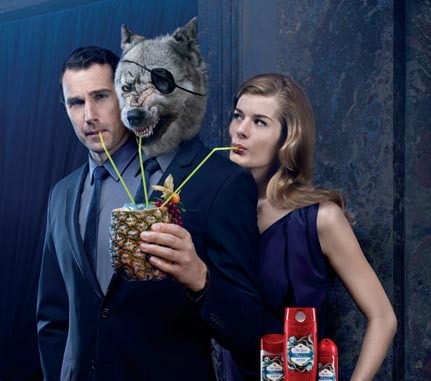 Everytime I see this ad from Old Spice, I do a triple take. First, my reaction is "ick" that's an ugly wolf. Third, my reaction is "what were they thinking? I would never buy that"
Are any of those reactions the desired response from guys? The women I've shown the ad to had similar reactions. Most said that the ads creeped them out and would make them think the guy who uses that particular Old Spice product was either dumb or smelly. My follow on question is why the "dumb" question, and the clarification is that "any guy who wears that trying to get woman would be dumb or desperate." The optimist side of me approaches this add differently. Maybe, the agency is going for extra campy, maybe the idea is to be soooo bad, that it's good? Additional searches will yield additional funny/campy ads, so this is clearly an attempt to be funny. In fact, maybe there's some demographic where this does lead to sales lift. I have yet to find anyone who thought that the ad was more funny than creepy, but at the same time I see that the ad continues to run. The only two explanations I can come to: 1) I completely don't get the demographic that this is targeted to, or 2) Someone in marketing at Old Spice is measuring lift around this ad. I really hope someone is measuring the success of this ad, as I would love to learn what demo this ad pulls in.